One of my most favorite things to order at an Italian restaurant is clams casino or any kind of seafood with pasta. I love it. I cannot get enough mussels, clams, lobster, whatever, you name it, I love it. 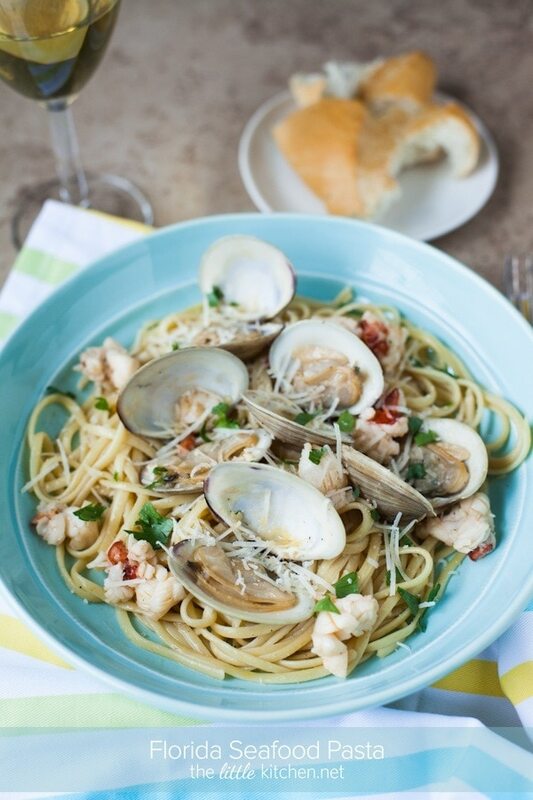 When my friend, Ricky, asked me to contribute a recipe to his new guide to Orlando restaurants that highlighted local ingredients…I knew I had to make a seafood pasta dish! 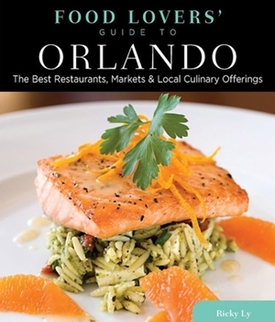 The Food Lovers’ Guide to Orlando is out now! It’s great, it’s packed full of great advice on the best places to eat in the area and includes recipes from some of my blogger friends and my favorite restaurants! First, I start the water boiling for the pasta. Then, I prep the lobster. 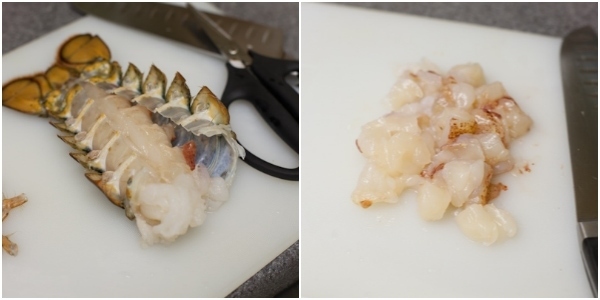 Cut along the bottom of the lobster tail and the top too. Then, pull out the tail and chop it up. Scrub the clams. Melt the butter and cook the garlic. Then, add white wine and olive oil and bring to a boil. Then add the clams. Cook those until most have opened and then add the lobster. Toss in the pasta and serve with parsley and parmesan cheese. Don’t you just want to dive in? The butter adds another dimension to the white wine sauce and I’m thoroughly obsessed with this dish and I hope you will be too! Planning a visit to Orlando anytime soon, be sure to pick this guide up! Once your family and friends taste this wonderful pasta dish, they won't believe how easy it is to make! I used Florida littleneck clams and Florida lobster along with white wine made from Florida grapes. Serve with a salad made from locally grown greens and your favorite crusty bread. Bring salted water to a boil and prepare linguine according to instructions. Meanwhile, in a heavy bottomed pot or French oven, melt butter on medium heat. Add garlic and cook for 2 minutes. Add wine and olive oil and bring to a boil on medium high to high heat. Add clams and cook for 7-10 minutes or until all clams have opened up. During the last two minutes of cooking, add the chopped lobster. Add salt and pepper to taste. 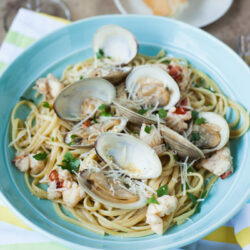 Add the cooked pasta to the seafood pot and mix to allow the clam sauce to coat the pasta. Add parsley and parmigiano reggiano cheese and serve immediately. Disclosure: Ricky was nice enough to send me a copy of the Food Lovers’ Guide to Orlando and I included affiliate links in this post. Love all of the flavors in this! I’m a huge seafood lover so this dish here is just SCREAMING my name! Yes, I want to dive in!!! This look so good! Love it Julie! This is beautiful! I miss having seafood since I have moved away from Florida. This is so, so beautiful! Between the pasta, the white wine sauce and all that great seafood…I could eat that every single day! Oh man, just reading over this recipe makes me yearn for the beach! YUM! I could go for some of that right now, it would make a yummy breakfast, right? Ill be think bing about it all day! Absolutely gorgeous dish, Julie! Love the sound of the white wine sauce! Looks very similar to what we serve here as Frutti de Mare. This looks SO good!! I am with you I love seafood pasta at Italian restaurants and one thing I love is steamed clams or any kind of clam dish really. I am adding this to my list of dishes to make soon! 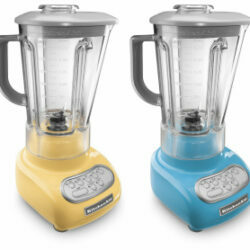 Oh and I LOVE the bowl you used – my fave color! Freakin’ love seafood pasta. This looks AMAZING Julie!! Holy cow that couldnt look more perfect!!! Yuuuuuumm! That looks incredible! We are huge clam and lobster fans here … but I’ve never had lobster in pasta — I am clearly missing out. Can’t wait to make this. What an impressive looking dish! The light wine sauce makes it a perfect warm weather pasta! 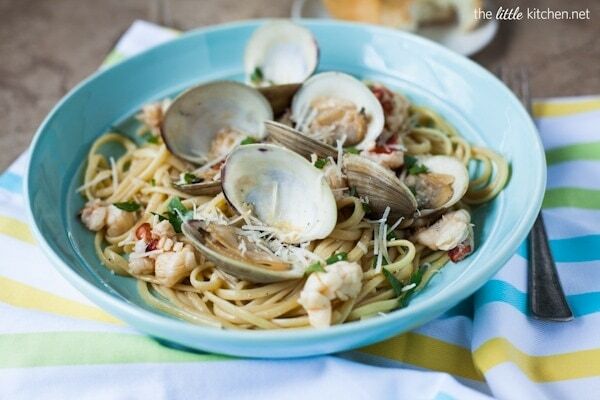 I hear you – it’s my favorite pasta dish, too…with lots of scallops and clams. Yum! I can’t wait to try this at home. Looks seriously tasty. Perfectly light and fresh for a summer evening with a glass of wine. Can’t wait to try! Fantastic! Wish we could get seafood like this in Tennessee! Congratulations on having a recipe in Ricky’s book! This pasta looks sooo good. I’m a sucker for fresh seafood. And somehow I’ve never had lobster or clams. I don’t like seafood in general but I guess I should at least give them a try. This looks great and love the white wine sauce! WANT! My mouth is watering just looking at this picture. I don’t know why, but I’ve always been afraid to cook my own seafood. I feel like it never comes out as good as it does at the restaurant. This looks like the perfect summer pasta dish! I love sea food with wine. You share a wonderful recipe of pasta. I never know that wine is also an ingredient, which can use to make the pasta. It looks too good in pictures. I am eager to try it at home and enjoy with wine.